BATTLE GROUND — Students at CAM Academy in Battle Ground are voicing concerns about the potential impact the proposed Battle Ground Public Schools bond will have on their school if passed, as they learn of the district’s future plans for the school. Under the bond proposal, CAM Academy would be moved from its current location off of Onsdorff Boulevard to what the school district is calling an Alternative Learning Experience facility on district-owned land off of NE 199th Street and NE 72nd Avenue. According to Rita Sanders, communications manager for Battle Ground Public Schools, the new campus will have a combination of a permanent multipurpose building housing a gym, cafeteria, offices and library, and two modular buildings with 10 classrooms in each. Sanders said the school district currently does not own the CAM Academy building, it leases it annually for approximately $500,000. She said that the district considered buying the building, but the assessed value was found to be $2.9 million, while the owner allegedly wanted $4.8 million for the building. Because the building is not owned by the district, Sanders said that the district cannot easily change the building, such as update it for different styles of learning. Having the CAM Academy campus on district-owned land would allow the district to make changes as it sees fit, and also would eliminate the annual lease. Sanders said that the total estimated cost for the Alternative Learning Experience campus is $12 million. She also said that the modular buildings are meant to be permanent facilities, and differed in that regard to older styles of more temporary portable structures. Students at CAM Academy have raised a number of concerns with the district’s plan to move the school, and a group of seniors have spearheaded independent research into the possible impact of moving the school. Prather-Albers agreed. No officials from the district came to inform parents, teachers or other staff, she said. Upon learning about the district’s plan, Probst said that she began researching the long term facilities plan. She said that the plan does not have any future consideration for moving the school out of the modular buildings, and if it did, building a new structure would be contingent on a bond passing in the future, with no guarantee of it passing. Probst also said that moving to the new location would adversely affect the lives of many students at CAM Academy. In its current location, she said, the school is in walking distance of many students’ homes, and also Battle Ground High School. Many students participate in sports or other extra-curricular activities at the high school and simply walk to the high school, and if the campus were to move, “how would we be able to do those sorts of extra-curricular activities?” Probst asked. The new location is not easily accessible for walking, Probst said. Prather-Albers agreed, saying that there are no sidewalks near the proposed new location, and the move would create difficulties for students whose parents work and cannot otherwise get rides to class. “I think that’s just really frustrating,” Prather-Albers said. According to Probst, a report issued by the state auditor in 2008 concerning schools in the state found that “excessive use of portables” was a common problem statewide. Battle Ground Public Schools has been discussing the need to reduce portables a lot lately, Probst said, and noted that the auditor’s report found that portables are isolating, less safe and secure, and less energy efficient so they end up costing more. Probst said that she did not understand the district’s planned usage of modular buildings for the new CAM Academy facility when both the state and the district itself are trying to reduce the number of portables being used. 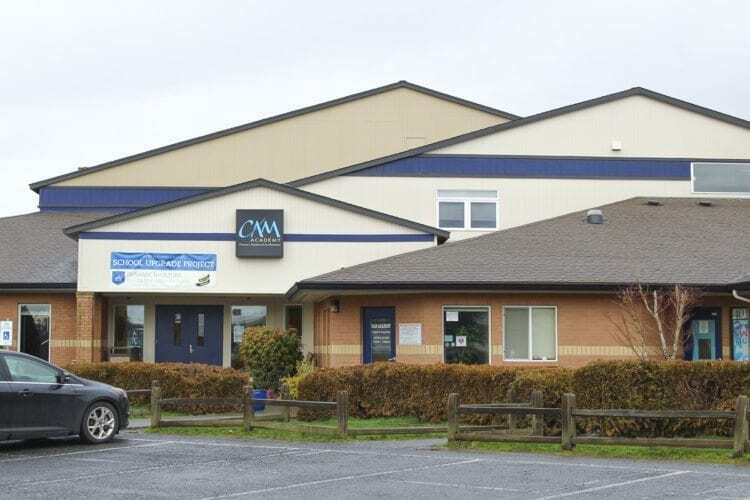 For many of the seniors at CAM Academy, the main fear about the proposed move is that it will adversely affect the unique culture and community that has developed at the school. Because third through 12th grade students are housed in one building, Prather-Albers said that it is very easy to get to know everyone at the school. “We’re housed together for a reason, and it creates a lot of respect from young students to old students and learning how to work together with not just your 10 people in your class but with everybody,” she explained. Moving the CAM Academy program to the new location would be “splitting up a community that cares a lot about each other and that wants to care about each other,” Prather-Albers said. Senior Benjamin Howard said that the district should focus on addressing other, more pressing problems in the system before looking to move CAM Academy, the best performing school in the district he added, simply because it is in a rented building. According to Sanders, the move would not have adverse effects on the student culture. Prather-Albers said that students at CAM Academy wanted their voices to be heard by parents, the school board and teachers. “A new building doesn’t solve anything and it’s not always what people need or what people want,” she explained. However, the students said that they were conflicted about the bond issue. Prather-Albers said that she did not want her classmates’ work to appear as if it said the bond was bad for the entire district. “We don’t want to come off as the bad guy,” she said. Senior Keegan Sanchez agreed. He said that after learning of the proposed move, many of his peers felt that the bond was a bad idea, but after doing more research they learned “it was great for all the other schools.” This put CAM students in a difficult position, he said. The students said that the response to their research has mostly been surprise and shock, especially from parents who were generally in favor of the bond but then learned of the proposed changes to CAM Academy. They said that confusion from parents was apparent, and there was a lot of surprise that the school district has not provided much information on the proposed changes. Prather-Albers said that the main purpose of the student’s independent research is to help voters be informed. In the end, she said that they are free to make their own decision regarding the bond, but that she and her colleagues want them to be informed as completely as possible about the full effects of the bond on all of the schools in the district.